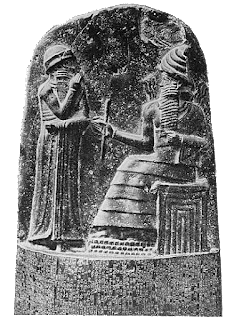 Bereishis: Start with the "Why"
Figures at top of stele "fingernail"
above Hammurabi's code of laws. To offer an alternative answer, the Torah begins with the “why” instead of the “what”. While the mitzvos surely are important, if the Torah had started with the first commandment given to the Jewish nation, they (the audience back then) and we (the audience today) would not know why we should listen to that commandment. 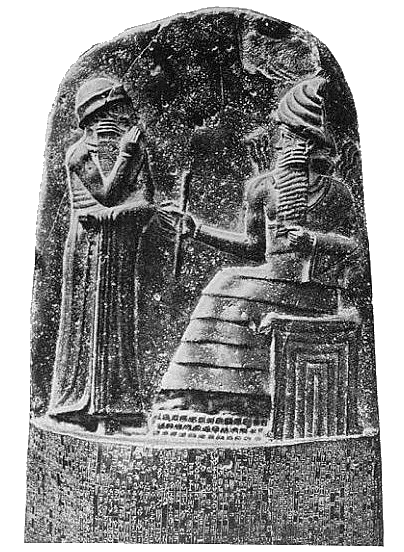 For all we know, this could be the Code of Hammurabi, an ancient Mesopotamian law code. It could be the laws of Eshnuna. It could be the laws of a cult of Molech worshipers. What is the nature of the Giver of these laws? What is the ethical nature of these laws? Why should we feel in any way bound by them? Parashas Bereishis establishes Hashem as the Creator. He creates the world. Then He creates Adam and Chava, places them in a wonderful garden, and then gives them the first commandment. Sefer Bereishis outlaying the early history of the world, showing how He was concerned with humanity behaving in a moral manner, interceding when necessary, in the Dispersal, the Flood, and in Sedom. Sefer Bereishis also explains the special relationship Hashem developed with the forebears of the Jewish nation, and how He took a wandering Aramean, Avraham, and transformed him first into a great family and then, from a great family into a great nation. The beginning of Sefer Shemos, prior to that first commandment, explains how Hashem redeemed the Jewish nation from servitude in Egypt. Indeed, we see this role of Creator or Redeemer as a basis for the laws of Shabbos (see Shemos 20:7-10 and Devarim 5:11-14). We rely on zechus avos, the merits of our forebears, for Hashem’s continued kindness to us. But, in parallel, one big reason for our continued relationship with Hashem is gratitude for how he treated our forebears. הָלֹךְ וְקָרָאתָ בְאָזְנֵי יְרוּשָׁלִַם לֵאמֹר, כֹּה אָמַר ה', זָכַרְתִּי לָךְ חֶסֶד נְעוּרַיִךְ, אַהֲבַת כְּלוּלֹתָיִךְ--לֶכְתֵּךְ אַחֲרַי בַּמִּדְבָּר, בְּאֶרֶץ לֹא זְרוּעָה. זכרתי לך. אם הייתם שבים אלי תאוותי לרחם עליכם כי זכרת חסד נעוריך ואהבת כלילת חופתך שהכללתיך לחופה, ולשון הכנסה הוא, כלולותיך נוצי"ש בלע"ז, ומה הוא חסד נעוריך? לכתך אחר שלוחי משה ואהרן מארץ נושבת יצאתם למדבר, ואין צדה לדרך כי האמנתם בי. (זכרתי לך חסד נעוריך) את שכחת חסד שעשיתי לך מנעוריך שגאלתי אתכם מתחת סבלות מצרים והולכתי אתכם במדבר וספקתי צורכיכם במדבר ארבעים שנה והריני מזכיר לך חסד שעשיתי לך מנעוריך כשהלכת אחרי. Sof davar, as we begin sefer Bereishis, we should consider this possible purpose. We don’t start out with the dry laws – the what. Rather, we begin with the role of Hashem, as Creator, as Redeemer from Egypt, and as Developer of the Jewish nation. In this way, we can appreciate why we should perform the mitzvos. Thus, בְּרֵאשִׁית -- in the beginning, בָּרָא אֱלֹהִים אֵת הַשָּׁמַיִם וְאֵת הָאָרֶץ, we should know and appreciate that Hashem created the heaven and the earth. Does Bal Yera'eh apply specifically to your dough (בְּכָל-גְּבֻלֶךָ)? ו שִׁבְעַת יָמִים, תֹּאכַל מַצֹּת; וּבַיּוֹם, הַשְּׁבִיעִי, חַג, לַיהוָה. 6 Seven days thou shalt eat unleavened bread, and in the seventh day shall be a feast to the LORD. This could very well be just a poetic alternation of "borders" for "houses", both giving the sense of "your domain". ז מַצּוֹת, יֵאָכֵל, אֵת, שִׁבְעַת הַיָּמִים; וְלֹא-יֵרָאֶה לְךָ חָמֵץ, וְלֹא-יֵרָאֶה לְךָ שְׂאֹר--בְּכָל-גְּבֻלֶךָ. 7 Unleavened bread shall be eaten throughout the seven days; and there shall no leavened bread be seen with thee, neither shall there be leaven seen with thee, in all thy dough. When you are making dough, you may not add sourdough, so as so make it chametz. You can thus only produce matzah. This makes sense, since for those seven days, שְׂאֹר לֹא יִמָּצֵא בְּבָתֵּיכֶם, no sourdough is to be found in your house in the sense of using it to make chametz. Shadal: What, or who, is הוּא חַיֶּיךָ וְאֹרֶךְ יָמֶיךָ? And this means that the etnachta is on וּלְדָבְקָה־ב֑וֹ. The etnachta provides a logical pause in the middle of the pasuk. Meanwhile, Shadal would place the etnachta on the word יָמֶ֔יךָ, and redraw all the trup to fit. for that is thy life, and the length of thy days; that thou mayest dwell in the land which the LORD swore unto thy fathers, to Abraham, to Isaac, and to Jacob, to give them. that thou mayest dwell in the land which the LORD swore unto thy fathers, to Abraham, to Isaac, and to Jacob, to give them. We need not dwell on the redrawing of the trup. It is regular and mechanical once you move the etnachta over. Onkelos' general style and purpose is to give the peshat translation of the pasuk. Yet here, in translating לֹא-יוּמְתוּ אָבוֹת עַל-בָּנִים, he renders the phrase as לָא יְמוּתוּן אֲבָהָן עַל פֹּם בְּנִין. The peshat would be that one does not punish the fathers for the sins of the sons. The derashat Chazal is that the testimony of the sons cannot be used against the father (in a capital case). And עַל פֹּם means "on the mouth of", which is "on the word of". So, Rav Schachter remarks, it is very strange that Onkelos here deviates and translates based on the derasha instead of the peshat. It is a good question. However, I think the answer is that, indeed, Rav Schachter is right, that Onkelos regularly gives the peshat translation. If so, we should consider whether עַל פֹּם can convey the peshat meaning. In the phrase עַל פֹּם, the word עַל is there because it is there in the pasuk, in the Biblical Hebrew. But maybe one might think עַל means "at the same time as," just as not taking the mother bird עַל the baby birds from a kan tzipor. And so, it is a little clearer to render the ambiguous עַל as עַל פֹּם. Father are not killed because of [the sins of] the sons, and sons are not killed because of [the sins of] their father. Rather than writing עַל פֹּם, Onkelos writes there עַל מֵימַר. We might have even thought in parashat Shofetim that this עַל-פִּי to mean "because of" rather than "upon the mouth of", but Onkelos there emphasizes that פי is to be taken literally as "mouth", and thus the "statement". And so, I would suggest the since Onkelos does not say עַל מֵימַר in Ki Teitzei, and because this would accord with the peshat meaning of the pasuk, he means עַל פֹּם as "because". We started Nazir the other day. And I resumed blogging at Daf Yummy. So far, I have two posts up. One about Geonic input into Nazir, and the Talmud in general. And another about Paziach, and what sort of language it is. I am not entirely convinced that when Rabbi Yochanan says it is לשון אומות, he means foreign languages. In parashat Ki Teitzei, we read that after an Israelite man takes a beautiful captive woman as a wife, he must treat her as a full wife. That means that if he no longer desires her, she is not a sexual slave to be passed on to the next man who will purchase her. Rather, there is a regular divorce and she goes free as a full Israelite woman. 14 And it will be, if you do not desire her, then you shall send her away wherever she wishes, but you shall not sell her for money. You shall not keep her as a servant, because you have afflicted her. “וְהָיָה אִם לֹא חָפַצְתָּ בָּהּ -- Rashi explains: The Scripture is informing / predicting that you will eventually come to despise her. And so it is in the Sifrei. And the Re’em [Rabbi Eliyahu Mizrachi] wrote: ‘I do not know from where they darshen this, for behold it [the words in the pasuk] are required for it [the law] itself. You can read the Sifrei on the first pasuk here and the Sifrei on the second pasuk here. 11 and you see among the captives a beautiful woman and you desire her, you may take [her] for yourself as a wife. Rashi is based on a Midrash Tanchuma Aleph on parashat Ki Teitzei, which couples Rabbinic disapproval for Ben Sorer Umoreh with the general midrashic approach of darshening semuchim (juxtaposed sections), particularly in sefer Devarim. Thus, Rav Kanievsky knows that Rashi is saying, based on a midrash, that the inevitable sad conclusion of marrying and staying married to a Yefat Toar is a Ben Sorer Umoreh. Therefore, the divorce which prevents this conclusion, constitutes good tidings, besorot tovot. And thus the midrash is based on Chazal’s derasha on the otherwise incongruous vehaya in the context of divorce. This is a marvelous construction which creates a harmonious whole out of several different midrashim and midrashic derivations. We need not worry about ma kasheh leRashi, what is “bothering” Rashi, or indeed, what is “bothering” Chazal. This construction appears concerned with this, insofar as the answer points out an incongruity -- the happiness implied by vehaya -- that sparked the midrash. Rather, I would look towards opinion plus opportunity, such as a displeasure towards the institution of yefat toar (certainly supportable in my opinion by various portions of the pesukim on a peshat level) together with the opportunity afforded by an ambiguous Biblical text to assert a predicted unhappy conclusion. Saying that the hatred of the married yefat toar, together with the divorce, is a happy occurrence is certainly extremely creative, but goes against the tone set by other midrashim (and as cited by Rashi in pasuk 11, that there are unhappy conclusions to his decision to wed the yefat toar. To find peshat in any one midrash, I believe it worthwhile to consider that midrash in isolation. Creating a hodgepodge of midrashim and midrashic methods takes one away from peshat in the midrash. Here we have brought in, from left field, the midrashic method of vayhi vs. vehaya, with happiness as a message. Sure, that is possibly supported by the language of besorah, but that feels like very tenuous support. We ignore the darshening of semuchin from Tanchuma and Rashi, but it is there at the least if we are going to be considering Rashi. Though perhaps, when focusing just on Sifrei, we should indeed ignore the darshening of semuchin. Meanwhile I feel that there is a more obvious and simple derivation for the Sifrei, also centered on vehaya. If we just focus on the two midrashim in the Sifrei, I would posit the following derivation. All examples pulled from Devarim perek 21 and perek 22. The Torah employs specific words to connote a condition. For instance, כִּי תִהְיֶיןָ לְאִישׁ שְׁתֵּי נָשִׁים, if a man has to wives. Of כִּי יִהְיֶה לְאִישׁ בֵּן סוֹרֵר וּמוֹרֶה, if a man has a rebellious son. The word ki introduces something which might happen, and explains what regulations cover that situation. Alternatively, the Torah might employ im to denote if. וְאִם לֹא קָרוֹב אָחִיךָ אֵלֶיךָ, and if your brother [who lost the ox] is not in close proximity to you. Meanwhile, the word והיה is regularly employed not to indicate a conditional but the next logical event in a progression. For example, וְהָיָה בְּיוֹם הַנְחִילוֹ אֶת בָּנָיו, and it will be on the day he bequeaths property to his sons. וְהָיָה הָעִיר הַקְּרֹבָה אֶל הֶחָלָל, and it will be that the city closest to the corpse will have its elders perform the ritual of egla arufa. וְהָיָה עִמְּךָ עַד דְּרשׁ אָחִיךָ אֹתוֹ וַהֲשֵׁבֹתוֹ לו, by keeping the lost ox in your possession, it will be with you when your non-proximate neighbor seeks it out. That does not mean that וְהָיָה cannot connote a conditional; just that it is regularly employed to connote a definite. Suddenly, in pasuk 14, we have וְהָיָה coupled with אִם. Is it “if” or is it “it will be”. The answer, according to the Sifrei, is that while this is given as a conditional law, since it describes what is to happen if he doesn’t like her, in fact, it is a certainty or near-certainty that this conditional will come to happen. Thus, it is both וְהָיָה and with אִם. And if you need a midrashic hook, you can say it is the incongruity of the וְהָיָה coupled with the אִם which sparks the midrash. 15 If a man has two wives-one beloved and the other despised-and they bear him sons, the beloved one and the despised one, and the firstborn son is from the despised one. On a peshat level, the word וְהָיָה is just continuing to describe an element of the conditional started by כִּי תִהְיֶיןָ. That is, this pasuk sets up the situation, and so וְהָיָה is warranted as a simple continuation of the situation. One need not repeat ki or vechi. And the conclusion of what regulations control the situation begins the next pasuk. However, on a midrashic level, especially after the previous similar derasha on the immediately preceding pasuk, we are primed to read this וְהָיָה as another inevitable conclusion. This is not peshat, but it is midrash, taking advantage of the ambiguity of language to read the pasuk in an unexpected and totally novel manner. And so, it is the hatred of the wife that will almost guarantee that the bechor will be granted to the disfavored wife. And the Lord saw that Leah was hated, so He opened her womb; but Rachel was barren. As such, we have no need to travel far away to bring in a completely separate derasha, about vehaya generally meaning happiness, which doesn’t seem to fit the context and thus sparks the midrash. This simply isn’t what Chazal mean. And so, I would deem the innovative interpretation of the midrash to be a brand new, neo-midrash, from a Gadol baTorah, but still not at all the intent of the midrashic author of the Sifrei. Since we are discussing Rav Chaim Kanievsky and how vehaya can be midrashically reinterpreted from a possibility to mean a definite and a prediction, it seems proper to discuss Rav Chaim Kanievsky and how his words were reinterpreted from a hopeful possibility to mean a definite and / or a prediction. As we’ve seen many times in the past, some of the people surrounding Rav Kanievsky are idiots, who regularly misinterpret his words to be messianic predictions. In response to such reports that he has issued a messianic prediction, Rav Kanievsky is on record as saying that this is “shtuyot”, nonsense, but this doesn’t prevent the idiots from continuing to turn his words into a choyzek. As with every statement attributed to Rav Chaim Kanievsky, this statement must be triple-checked and verified before believed. Emotional moments in the home of the Prince of Torah Haga'on Rav Chaim Kanievsky Shlit"a who hosted in his home the chairman of Yad Sarah - Rav Moshe Cohen - and the director of the emergency switchboard and home hospitalization program - Rav Nachum Gitman - who accepted his blessing. At the focus of the visit stood the initiative to install an emergency button in synagogues and Mikva'ot. They were discussing a new initiative from Yad Sarah that was born against the backdrop of a deteriorating security situation. During the visit, the button and the mode of operation of the emergency switchboard of Yad Sarah were presented to the Ga'on Rav Chaim Kanievsky Shlit"a. The Ga'on Rav Chaim Kanievsky's response was "Mashiah will come before the holidays and you won't need to install any more emergency buttons." Additionally, the rav blessed the switchboard operators with blessings of success. בטוח אמר זאת מתוך אמונה ותפילה, וכמשאלה הרי אנחנו מחויבים להאמין ולחכות לו בכל יום שיבא, ולא כנבואה. I would say that this is the jussive. Hebrew can be ambiguous, and the jussive or subjunctive (“let there be light”, “may there be light”) can sometimes be expressed in the same way as the perfect (“there will be light”). Rav Kanievsky was expressing a hope and a blessing, but overeager people took his words and corrupted them to mean a prediction. There was a story that happened last week that caused all the ruckus. A young girl who had recently died reportedly came to her father in a dream saying that on Thursday, the day after a solar eclipse, Mashiach would come. The father went to Rav Kanievsky to relate the story and Rav Kanievsky supposedly told his family (after) to purchase a new suit for Thursday (presumably with which to greet Mashiach). This created the ruckus. The story was later denied by the family of Rav Kanievsky and explained as a misunderstanding. Rav Kanievsky was asked by an avreich about purchasing a new suit for a wedding, and he answered with a smile and a joke that maybe Mashiach will come and he will also be able to use the suit for that. That is the source for the balagan, as reported by Mishpacha magazine (Hebrew edition). מצוה גוררת מצוה, ועבירה גוררת עבירה. כדי שלא תמצא חן בעיניך. כי תהיין לאיש שתי נשים וגו'. שתים בבית, מריבה בבית. ולא עוד, אחת אהובה ואחת שנואה, או שתיהן שנואות. כי יהיה לאיש בן סורר ומורה. כל מאן דנסיב יפת תאר, נפיק מנייהו בן סורר ומורה. That is, one mitzva leads to another mitzvah and one aveira leads to another aveira. The purpose of the growing of her nails and shaving of her head is to make her unattractive, so that you don’t marry her. Written immediately afterwards is the case of a man with two wives. Two wives in the house, discord is in the house, and not only that, one if loved and the other is hated, or both are hated. Written immediately afterwards is the Ben Sorer Umoreh. Whoever marries a beautiful captive woman, from her will emerge a Ben Sorer Umoreh. This midrash Tacnhuma looks at both Yefas Toar and polygamy as much less than the ideal. This Rabbinic disapproval couples with the general midrashic approach of interpreting juxtaposed sections (darshening semuchos), especially in sefer Devarim, to say that one juxtaposed bad result is the inevitable conclusion of the earlier bad action. Rashi clearly understands Midrash Tanchuma as saying both the hatred and rebellious son stem from marrying the beautiful captive. This might well be what our Midrash Tanchuma is saying, but besides this, Rashi works off Midrash Tanchuma Aleph, which often differs in details from our Midrash Tanchuma.